As I expected, I think I'm one of the only ones to think NbN simply could not of been improved. You sir, are not alone. Hitchcock is one of my favourite directors because he represents the perfect film for me. I'm pretty sure it is my fault. And what you say is probably exactly why I'm not interested as I seem to prefer imperfect films, films that search for something, films where the tone, the atmosphere is more important than the story. I'm not familiar with the parody. Is Arizona Dream worth seeing? Not for the parody alone, although there are a few more riffs on other classics. It has Kusturica's special brand of magical realism, melodrama and humor, made more accessible by a well-known cast. But it meanders quite a bit and someone who doesn't like Kusturica's seemingly inconsequential and absurdist style might find it boring. I love it, of course. Alfred Hitchcock's landmark masterpiece of the macabre stars Anthony Perkins as the troubled Norman Bates, whose old dark house and adjoining motel are not the place to spend a quiet evening. No one knows that better than Marion Crane (Janet Leigh), the ill-fated traveller whose journey ends in the notorious shower scene. First a private detective (Martin Balsam), then Marion's sister (Vera Miles) search for her as the horror and suspense mount to a terrifying climax where the mysterious killer is finally revealed. By 1960 Hollywood had changed a great deal. The strict studio system was all but broken and the Golden Age was over. Although Alfred Hitchcock had fought the producers on many of his pictures during this time, he had also flourished. He was shrewd enough to play them at their own game and often his films were more interesting because of some awkward compromise, so it was always possible he would falter while a new breed of filmmaker would overtake. In fact, brilliant though North By Northwest was, had he continued in that vein he would have quickly become a bloated self-parody. The reason I say this is because Psycho more than any of his others from this time, looks and feels like a classic Golden Age studio film. Its black and white, stark photography by John L. Russell, and nourish premise regress it by 10 years at least, more suitable to the time of Shadow of a Doubt and is as sharp and lean as that film. It must have been refreshing for an audience of a certain age to settle into such a familiar style. Of course, Hitchcock is lulling the viewer into a false sense of security, brilliantly using the familiar conventions to support a brave screenplay. Hitch, The Master of Suspense, had been tightening the screws on the viewer and his lead character, Marion Crane (Janet Leigh) as she wrestled with the paranoia and guilt of stealing her boss’s money so she could run away for a new life with her lover, Sam Loomis (John Gavin). By his own definition, nothing could happen to her until that last act because that wouldn’t be suspense. But then he takes away the safety net in the spectacular and still effective classic shower scene, pulling the bath mat from under the audience, so to speak! That moment hasn’t dated at all. In fact, I’d go so far as to say it is still the most powerful screen murder. Hermann’s classic theme is set aside for the moment; George Tomasini’s frantic editing, the awful screeching and those lingering final seconds are all the more heartbreaking because we’ve come to know the character so well. From this point on all bets are off and the film is unquestionably superb with Hitchcock clearly relishing finally being able to test the viewer. The narrative had already gently shifted focus to the nervy-perv Norman Bates (Anthony Perkins) in a clever scene where he brings Marion something to eat (it stops being her story when she joins him for lunch) which is audacious enough for a classic plot and Perkins excels under the uncomfortably close focus of the camera that reveals all the tics of one of cinemas greatest characters, the ultimate mummy’s boy, cleaning up after his bonkers parent who we only see fleetingly, in shadows, or hear her grating voice. Repeat viewings reveal layers upon layers in his performance. The final act has a couple more shocks in store and the brilliant thing is, they are fundamental. Nothing is contrived and it withstands scrutiny. The ending is unusually indulgent for a Hitchcock movie, with Simon Oakland as Dr. Richmond revealing the intricacies of Mrs. Bates like a ghost story! But of course, she has the last word in a beautifully judged final shot that lives on long after the film. This isn’t suspense, but a true properly scary horror, which in itself was a shock for the Hitchcock faithful, especially considering his regret over Sabotage (the difference being Psycho lingers on the horror). If you think I’m being over dramatic, consider Peeping Tom, released the same year, with a similar attempt to test the viewers willpower. Sadly, although a brilliantly successful film with a recent re-evaluation, the experiment backfired and destroyed director Michael Powell’s career. Some say Psycho is Hitchcocks best film and although I don’t quite agree, it’s difficult to argue against. It is as least his most memorable, a milestone in the horror genre and one of the finest films ever made, finding new fans in every generation. As Rich said, it'll still make your skin crawl! This could be Alfred Hitchcock's most unusual film, although perhaps it's even stranger that such a taut horror comes from Daphne Du Maurier (Rebecca). Although he had already handled horror in Psycho, that was really a logical extension of his thrillers. The Birds on the other hand is more typical of the paranoid sci-fi b-movies of the 50s, with a small town facing an absurd threat that can't be explained. So they don't! The closest they come is a great scene in a cafe as the townsfolk argue over the reasons for the birds strange behaviour. It's like a high class Twilight Zone with some classic moments and a wonderful atmosphere that borders on post-apocalyptic. It stars Tippi Hedren in her first role and she's very good as the Paris Hilton of her day, but that side of the story comes across as a bit odd. The first part is about her pursuing Mitch Brenner (Rod Taylor) to Bodega Bay on a sort of whim, and the absurd lengths she goes to get two Lovebirds to his little sister after a brief meeting in a San Francisco pet shop. The story is about the dangers of complacency, so a bored socialite having no purpose in life heralding the attacks is ironic, but certainly not obvious. It is very witty though and her scenes with Taylor are great fun. He provides substantial support, along with the superb Jessica Tandy who brings another level of class to the whole production. 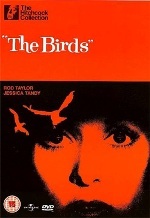 There's a sense of heightened reality from the start in Hitchcock's most consistently colourful film since The Trouble With Harry, with the sound design unusually prominent (overdone tyre screeching, etc) in place of an entirely absent score and used to grating effect when the birds start attacking. Those attack scenes are all brilliantly and indulgently staged with some very clever "yellow screen" effects. The moment when the gas station blows up is a highlight and followed with a wonderful aerial shot. Other stand-outs are the quieter scenes, like Jessica Tandy finding the body with the eyes pecked out in a fantastic three step zoom and her strangled scream shortly after conveys more terror than Wes Craven has ever managed in his entire career. The crows gathering on the climbing frame behind Hedren and the resultant attack on the kids is incredible, outdone only by the last act, with a frenzied, claustrophobic attack on one character followed by the classic final shots, most brilliantly parodied in a Simpsons episode! Now I look again, I think this rather unassuming bit of fun has proved to be very influential. The aerial shot and Tandy's scream, notable again for there being no theme, in particular contribute to an atmosphere you can pick up on elsewhere, like in Jaws maybe, whose story mirrors this one very closely in many respects. This is a classic, simple horror that still has the power to turn your stomach in knots. Jon I need some advice with 'Psycho'. Basically, as you might have seen me type around the forums... horror is my least favourite genre. Not becuase I think that all horror films are crap and a waste of my time, but becuase I just get too damn scared watching them. So scared that I can never enjoy myself and that it usually ruins my week as I have trouble sleeping after watching a horror. I do however have an unwatched copy of Psycho here that I really want to attempt, I'm very interested in watching it as it's one of those famous films that I have seen parodied/referenced in hundreds of other films and I want to watch the original source. Some of my friends have told me that it's absolutely terrifying, while others say that because it's so old it isn't as scary and you sort of know what's going to happen anyway (I find it hard to believe them). Anyway what do you think, for someone who can't even watch Signs or even The Blair Witch Project without properly freaking out, (yes, it's true) do you think I could tackle this one on my own or should I wait for a nice sunny day and watch it with a friend to make it easier on myself? Oooh, well, that's a tough one! To be fair, The Birds might be "scarier", depending on your sensibility. In any case, I like being scared and wish I could find a film to properly give me the shits, so to speak, but I'm a big tough bloke so of course, that film hasn't been made... Anyway, on that basis, I encourage you to just sit down and watch it, asap. Why not have a couple of friends around and watch it in a double-bill with The Omen? It is possible you will find it tame, but I have a gut feeling that you will respect it enough to see past the black and white, and the old style, to find the core story. And maybe it will creep you out just a tad. Usually there is a safety net in these sort of stories where you recognise a contrived plot point or a writers leap of faith that makes you think, "nah, this is silly", even if it's brilliant. No such thing here. I mean, blimey, the very last line still manages to send a shiver up this big tough blokes spine! Hopefully Pete is reading this. He has often admitted in the past that he only recently started watching older films. I wonder if this is one he came late to and if he found it scary? I know he likes it. He's reviewed it twice here! When I finally saw Psycho I didn't really think it was scary..though I did think it was creepy. If you thought Blair Witch Project was bad, you definitely will need daylight and friends to watch this. But, you absolutely must watch this movie. It is possible you will find it tame, but I have a gut feeling that you will respect it enough to see past the black and white, and the old style, to find the core story. I personally love old films, especially black and white ones and have always enjoyed watching them. The age of psycho isn't really one of the issues for me here it's just how scary it may be. Anyway, on that basis, I encourage you to just sit down and watch it, asap. Why not have a couple of friends around and watch it in a double-bill with The Omen? Hmm I dunno about The Omen but at this stage but I might wait until I can watch Psycho with a friend. I have a friend who has already seen it and liked it so I might watch it with her. By the way how many version of The Omen are there? Wasn't there are remake released not long ago? I think I should set the scene here. I watched Blair Witch on a small laptop screen, with two friends, in the middle of the day, in a bright sunny room... at the beach! And I still found that film scary haha, even though it's so stupid it just freaked me out. It was remade in 2006. There were four films in the original run. You need only concern yourself with the original one. The first sequel is pretty good too, but it stands alone as a superb religious thriller. I mean, I'm not asking you to consider The Exorcist or anything! Actually though, I did pick The Omen as a random title while considering you dislike horror in general. Like Psycho, it's a good, if heavily romanticised, story that holds up to scrutiny. Wow it's so strange that you just mentioned The Exorcist! Usually I would think nothing of it but I had a dream about The Exorcist just last night. In my dream someone gave me about 10 DVD's and it was one of them, I remember just looking at it and not knowing what to do becuase I knew I was too chicken to watch it haha. Creepy. Maybes it's a sign of some sort . It was remade in 2006. There were four films in the original run. The deadline was so far away from the day it was posted, I forgot all about it. Will watch Marnie later today or tomorrow.